Life On A Rock is the sixteenth studio album from American country singer Kenny Chesney. The album comprises ten songs, eight of which are co-written by Kenny. The overall theme of the album differentiates from last year's Welcome To The Fishbowl in that it is a lot more relaxed and has a much stronger reggae influence. Whilst I liked his previous album I do feel this brand of reggae-influenced country is where Kenny belongs. The lead single from the album is also the lead track - Pirate Flag. The mandolin hook is very catchy and makes you want to dance along but I do feel that there are better tracks on the album. 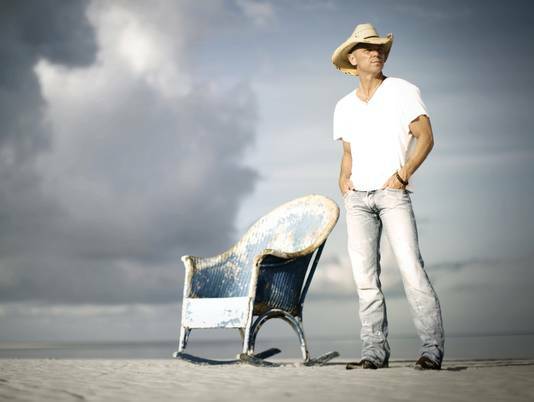 The track stays in tune with the party atmosphere of the lead single from his previous album (Feel Like A Rockstar) however I have always seen Kenny Chesney as a consummate story teller who suits slower, more relaxed songs and will be interested to hear which song will be the next single. My favourite track from the album is definitely When I See This Bar. At 6:02 it is the longest track but has a great flow to it and a perfect instrumentalisation. It is a very lyric based song and I find myself wanting to keep playing it repeatedly. I think the message behind the song is a great one, one of all the memories associated with a particular place and whilst the song is written from Kenny's experiences I feel there is something in there that everyone can relate to. Another track that is definitely worth a mention is Spread The Love, an almost straight reggae track featuring The Wailers and Elan. If you really don't like reggae I'd say don't listen to this song however Kenny does well and I can imagine this is great to see live. "I wrote a lot of these songs without music. I just wrote the lyrics down and tried to take moments from my life and my friends lives, and some of their stories, and the crazy characters I've met, and tried to give them a pulse, tried to paint a picture, and honestly tell a story that I haven't been able to tell up to now because of the nature of our business and the way we make music. And not only did I write without music initially, I wrote them without expectations, without a timeline. I wrote them without editing myself." The album as a whole invokes long summer days and lazy summer nights and I'm sure a lot of people will enjoy it. A great album from Kenny and one that in my opinion far surpasses Welcome To The Fishbowl. As I previously mentioned a lot of the tracks have a reggae influence however I would say fans of Kenny will love the album and I would urge anyone who isn't normally a fan to listen to a least a few of the tracks.